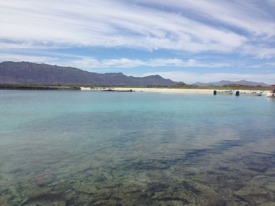 Isla Monserrate is an uninhabited island in the Loreto Municipality of the Baja California Peninsula. The bluffs on the island provide beautiful ocean views, and travelers can spend time snorkeling in the reef. In addition to marine life, Isla Monserrate is home to 13 species of reptile, such as the endemic Isla Monserrate Whiptale.